Summary: Elaine throws a party to impress her art gallery contacts, but fears her high-class guests will discover she’s a cab driver. Andy: Elaine Nardo showed up at the Sunshine Cab Company in week one looking for a spot of moonlighting. She didn’t lack for confidence, and much more so than fellow newbie John, she slotted right into the gang like she’d always been one of them. Cory mentioned the ease of her rapport already in the series’ second episode. Yet when it’s finally Elaine’s turn in the spotlight, here in episode five, both that confidence and that camaraderie suddenly feel a little flimsier. A little less of the former and more of the latter would’ve improved an episode that was light on both stakes and laughs. The soiree at Chez Nardo at the center of “Come As You Aren’t” is a classic sitcom setpiece: One character has a secret that she desperately needs to keep from all the guests, but darn if those wacky friends of hers aren’t bound to muck it all up somehow. And yet, both sides of that equation fail to materialize. I didn’t get much sense of how badly she needs to keep her secret side gig under wraps, apart from some panicked haranguing of Alex. And even more disappointing, the departure of Bobby, Tony, and even Latka after barely thirty uneventful seconds drains the whole event of chaotic comic potential. I’m not expecting Taxi to suddenly go full-scale farce, but this script left a whole lot of possibilities on the sidelines. I did enjoy the twist where she and Alex switched places on who wanted to tell the truth and who wanted to keep the lie going. And I did enjoy that Elaine’s reasons for coming clean came from her wanting to assert some dignity—that she didn’t deserve to be so easily forgotten just because of her vocation. But again, I never felt like her stakes were all that high to begin with, and by the time the charade is in full swing, it’s become at least half a story about Alex trying to get laid. The whole story felt loosely sketched and oddly paced from the start. The resolution, which was supposed to be a touching moment between Elaine and Alex, served them both poorly. He came off as petty and petulant, and she was depressingly limp in a situation where she’d have just as much right to be pissed at Alex for pouting. She had a lot more to lose by spilling the beans than he did! That said, I do think what they’re trying to explore in this episode is an idea that’s important for the series. The events of last week showed how the cabbies (with the exception of Alex) would love to break free of the garage and follow their dreams, while “Come As You Aren’t” touched on another side of the job: that driving a cab is far from a prestigious thing to be doing with your life. Granted, Elaine’s not ashamed of her job as much as she is worried about knowledge of it will do to her professional ambitions, but there’s still the idea that you’re on the bottom rung and may well be dismissed. Alex is certainly hurt that he didn’t get to hook up with the blonde party guest, but being referred to as garbage for what he did seemed to sting even more; and Bobby suspects almost immediately the reason she doesn’t want them to come is because “We’re nobodies. We’re stupid, ignorant, low-life cabbies.” It’s a melancholic air that belongs in a blue-collar show, and one that contemporary shows like 2 Broke Girls would be better humanized if they had more of. And as an afterthought, I want to applaud the show for not going the Sam and Diane route with Alex and Elaine, in that there’s not an ounce of sexual tension between Judd Hirsch and Marilu Henner in any of the extended scenes where it was just the two of them. I like the helping hand he’s willing to lend her in preparing for the party despite being slightly offended she tricked him into coming by early, and the fact that he’s willing to forgive her because he can tell how important his respect means to her. After years of will they/won’t they sitcoms, I like the fact that two adults can have a platonic friendship, and hash out difficulties without sexual tension. Noel: On the whole, I may have liked it more than either of you, though I do think it’s the weaker of the two episodes this week. Certainly the episode fails to pay off its potential for farce by having the rest of the garage not make much of a fuss at the party, either quietly slipping away or heading home with a young lady (Latka’s English lessons must be paying off, or the girl’s just nuts for a non-specific foreign accent and gibberish), but I think there’s something to be said for the fact that Bobby, Banta, and John left so quickly beyond the loss of comedic hijinks. It’s all in that swagger the three of them put on. They’re walking the same, similar clothes, and they’re not talking to anyone else. They’re trying to fit into this imagined middle-class apartment (remember that Elaine had to borrow the furniture, and it’s telling how different the two sides of the apartment are just in terms of furniture) and failing. So rather than make an effort and face possible embarrassment in this mock-classy situation that Elaine has constructed, they become victim to their place on the economic ladder and slink out. Even if asked what they did and specified their dream careers, what do they say? “I’m an actor who’s never had a job in three years.” “I’m a boxer who thought he knocked down the champ but it was all a hoax.” “[insert whatever it is that John does when he’s not driving a cab, I still have no idea who he is. ]” They’d have to lie no matter what, really, and their departure is an oddly honest, if melancholy, reaction to a situation predicated entirely on lies. Cory: This episode was one I was greatly looking forward to, considering Elaine’s oddly easy and comfortable placement within the group. I was hoping that an episode focused on Elaine would not only develop the character in a fashion similar to what we’ve seen with Tony and Bobby (and, with the next episode, Louie) but also give us a better understanding of how she fits in with the other members of the crew. “Come As You Aren’t” accomplishes that first task, though not as well as I would have liked, and unfortunately almost entirely eschews taking on the second one. Learning about Elaine’s struggle to keep her children fed while “slumming” it with one job and chasing a difficult dream with another was time well spent. I appreciate the small details that help reflect Elaine’s circumstances, like the canned champagne and the borrowed furniture. And yet, I too felt that leaving most of the rest of the cast on the sidelines was a disappointing and slightly weird choice. I like the way you rationalized it Noel, and perhaps the show’s writers wanted to mix up the formula just a bit and get away from the “the gang supports one of their own!” stories. Nevertheless, I’m struggling to buy that Elaine is totally part of the group in the way we’ve seen her in previous episodes when she’s not really portrayed that way here. I don’t mind if she’s a bit of an outsider, or not entirely comfortable with the other goofballs crashing her classy shindig. In fact, that makes sense. She is new and all. But still, the disconnect between Elaine’s place in the group in the first few episodes and where she takes a stand here is curious. Couldn’t have Bobby just acted like someone better/cooler? Summary: Depressed at where he is in life, Louie is afraid to face his old classmates at his twenty-year high school reunion, so he gets Bobby to go in his place. Andy: I’m not sure what it says that, for the second episode in three weeks, the B-story is essentially “Alex gotta get some.” If that came out of a note from the network—make your stand-up moral center hornier!—it ranks up there with the weirder notes to ever make it to the screen. 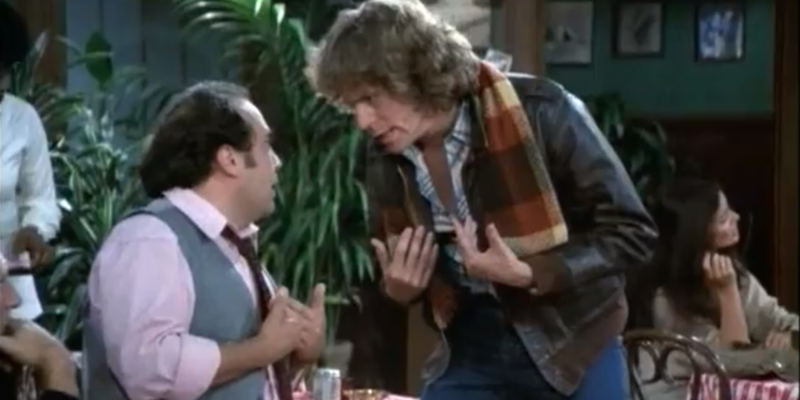 But unlike with “Come As You Aren’t,” that runner does nothing to weigh down “High School Reunion,” the funniest of the five episodes we’ve watched so far (and also one I’ve seen many times, as many as any Taxi episode probably). The “one character pretends to be another” trope isn’t all that common, but it’s a trope nevertheless, and a tricky one to pull off. It’s also one that normally occurs deeper into a show’s run, since it depends upon an audience’s clear sense of both the impressionist and the impressionee. The Taxi writers knew how evident it already was what they had in Louie DePalma, one of the most immediately indelible characters in sitcom history. This is an important episode for everyone’s character, in a sense. It’s the right time to add some nuance to the relationship between Louie and the cabbies, and doing so in a hang-out—outside the work setting where he rules with an iron fist—is a smart stroke. While they may not like the guy (and for plenty good reason), on some level, he’s still one of them. Les: Once again, it’s an episode where someone at the cab company is, if not actually ashamed of their job, very aware of how it’s perceived by other people and trying to find a way around the truth. And it’s another episode where a character had a ruse that was was going remarkably well but decided to screw it up for a personal whim, in this case the sniffing of your high school crush’s hair. And once again, their screwing it up led to the best possible result, though where Elaine got the professional validation she was striving for, Louie got something far more visceral: the ability to bring the world down on the heads of his past tormenters. This is certainly a remarkably good episode of Taxi, and one where they definitely seem to be developing a handle on the characters. Louie just gets better and better the more screen time they give Danny DeVito, and we see here he’s able to invest a fairly unsympathetic character with sympathetic traits—the moment where he discusses the high chair incident has a legitimate amount of pathos to it. There aren’t enough words to describe how fantastic that impression of Louie that Bobby did was, and while Alex’s increased horniness does scream of outside influences, Hirsch at least keeps him from seeming sleazy or desperate. I’m still unconvinced however that they know what to do with Latka—much like you said last week Noel, I’m finding it harder and harder to justify Andy Kaufman’s presence on the show. I’m not up on my classic 1970s comedy so I don’t know how big Andy Kaufman was at this point in history, but I’m wondering just how much he moved the needle. He’s in for a moment, does his schtick, and then is out. The other thing I wanted to mention about this episode that I found rather remarkable is something that we’ve seen quite a bit of already in this trip through Taxi, and something that I think gets to what our friend and colleague Jaime Weinman talked about in his marvelous essay in defense of the multi-cam sitcom: the way it takes its time as a performance. The opening scene in the bar takes up the entire first half of the episode—I clocked it at just under 12 minutes—and in that scene there’s an incredible sense of rhythm. Alex periodically breaks off to flirt with the waitress* or bring Louie back to the table, but it never breaks the flow of the action, or the sense that you’re watching real people have a real conversation—they just happen to be a hell of a lot funnier than the people you typically hang out with. The more we watch this show, the more I understand why people want to see something like it come back (and in some cases, why they feel ridiculously burned when they’re fooled into thinking it is). *In keeping with our recurring mentions of Community, I can’t be the only one who got a Professor Slater vibe off the waitress when she said she didn’t date taxi drivers. Noel: Conaway does steal the episode, but after a few days, I have clearer memories of DeVito’s performance, which offers lots of fun ways for him to shine, from the horrible vocalizing with the jukebox to snarling at folks around the table to the wistful, nostalgic hints of the broken man laying buried that grouchy exterior expressed through lilts in his voice and wide, shining (not gleaming) eyes. So, yes, by the time Louie reaches for Sheila’s hair, I so badly wanted both for him to do it for the sake of closure, and not to do it because I want him to have realized that those people don’t care about him, and that for all their comments and avoidance, his co-workers do. And it’s all thanks to DeVito’s performance. In a sense, both of these episodes this week reward their characters. Elaine’s colleagues don’t (completely) disrespect for her being a cabbie, and instead see it as another means of supporting herself and her children, and she’s able to extract some measure of dignity from the pompous jerk from the opening scene. Louie gets everything he wanted in that delirious domino finale: the fleeting sensation of Sheila’s hair and ruining their big night just as they ruined his prom. The garage doesn’t destroy all the dreams all of the time, but then maybe these are just flukes. Cory: We (well, I) haven’t seen too many episodes of Taxi yet but this effort is a masterclass in comedic writing. As Les mentioned, the first half of the episode bounces around within that one bar set, where each little story or gag is purposeful and/or humorous. The needling and storytelling at the table was similarly strong. We’ve already discussed this previously but it is worth mentioning again how well the characters seem to get along, despite any surface conflicts. I enjoy how much of the show thus far is built around characters telling stories about their lives and yet, it is never didactic whatsoever. Part of that is the great writing, but the actors also know how to make fairly simple beats more palpable and energetic. There is a lot of funny stuffy in “High School Reunion,” but I probably laughed the most and longest at Louie’s one-man vocal performance over by the jukebox. I simply adored how it kept going on in the background as other characters’ stories took prominence in the foreground. DeVito knew how to milk it as well, emphasizing certain notes or getting louder when it was his turn again. Aces, Jimmy Burrows, aces. Then, “Reunion” makes a great transition from a more character-based place to the more overtly funny and farcical in the second half. The switch is instantaneous and seamless, and perhaps most importantly, the second half of the episode pays off much of what we saw in the first half. Bobby’s (and Conaway’s) work is tremendous. It’s interesting how the show finds a way to make a story about one character (in this case Louie) turn into a similarly important bit of character work for another (here it’s Bobby, obviously). In that regard, even though each of this initial episodes is built around one person on the surface, the stories end up deepening other characters along the way. And that final scene? Wow. Not only was it well-performed by DeVito—the look on his face at the end is priceless—but again, it was also impressive on a technical level. To pull all of that extended chain of events off in one take (whether or not it was the first one is neither here nor there) is very admirable. What a fine cap to a lovely episode that had a little bit of everything. “there’s not an ounce of sexual tension between Judd Hirsch and Marilu Henner” Interestingly, there was backstage. I agree with you–very refreshing to have an on-screen male/female relationship where both sides are just interested in being friends. IIRC, they did do a show where Alex and Elaine tried to date, and they realized it didn’t work out (or perhaps I’m confusing TAXI with another sitcom that did this, but, boy, I sure think it was TAXI). “I don’t know how big Andy Kaufman was at this point in history” Big. Big big. His prominent “And” credit is no accident. The extra who played Latka’s party hookup is the great Treva Silverman, who wrote wonderful teleplays for THE MONKEES and MARY TYLER MOORE. Since doing this I’ve watched many more TAXI episodes, and the relationship was explored at one point – the episode “Vienna Waits” in the fourth season. And fascinatingly for a show, they treated it entirely as a one-time thing.